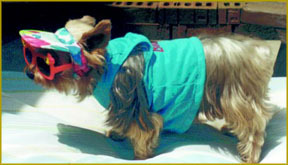 DogStation Photo Gallery - PetStation -- all about dogs, puppies, dog care, etc. This section is dedicated to all of our waggy tail buddies!!! Please include your name, the pet's name, your city and state of residence... and tell us a bit about your pet. Chances of your photo appearing in the gallery are dependent on the quality and personality of the shot, and the overall quantity photos received. No b&w photos, please. If we don't use your photo, it's not because we don't like you. Your picture just didn't work very well for the World Wide Web. Please try again. We really do want to show off your pet. Professional Pet Photographers, please get in touch for a special offer. Having at last found true love, Jack Russell Terrier "Jackie" may be expecting pups soon, according to keeper Rick R. of Miami Beach, Florida. Jackie may look familiar to our European visitors who might have seen her featured in magazine advertisements. 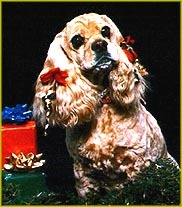 10 year old Cocker Spaniel "Sassy" shows off her Christmas presents. According to keeper Susan R. of Los Angeles, California, Sassy still looks and acts like a youngster. "Me? Need a brushing? Nah! 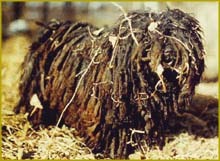 ", says "Bella" a 3-year old Puli. Bella lives in Edmonton, Alberta, Canada with her friend Andrea, who adds: "Bella's problem is she wants to be a dirty puppy! You can bath her, which by the way takes hours, and 2days of drying time, and she will head for the nearest mud puddle, or pile of dirt, and roll on her back in it! Then of course at night she wants to sleep in my bed. Her other habit is herding socks. She is not content if she doesn't have every pair of socks, clean or dirty, in her little pile on the bed!" 10-year-old Yorkshire Terrier "Bandit" may be a bit on the small side and getting up in age, but is certainly still one "cool dude." "JASMINE" (left), a five-year-old female Golden Retreiver, and "BRANDY", a four and a half year-old female mixed-breed, glow in the Virginia sun. According to owner Todd Pavela, Brandy was raised around kittnes and likes to pretend she's a cat. Jasmine likes to hang close to Todd, and chew on household items she's not supposed to (sounds familiar!). This group lives in Falls Church, Virginia, USA. 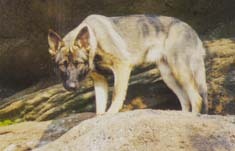 Sage von Faust / Sch BH, or "Sage", does her best wild wolf impression. Sage and keeper Rich live in central Connecticut. Irish Setter "Copper" strikes an elegant pose. Copper is the best pal of Antony Reno of Malvern, United Kingdom. "Sammy", a Spaniel-Border Collie mix, says, "OK, Lars, you can take a photo of this, but don't even think about a ride." Sammy and keeper Lars Broberg live in Stockholm, Sweden. "Muffin" a Norwegian Elkhound pup, seems to say, "It's OK to play with this, isn't it?" Photo by Kevin Gallagher, Connecticut. "We wuz framed! They can't pin nothin' on us! We demand to see our lawyer!" a passle of 6-week-old Rottweiler pups plead as they are hauled to the sheriff, er vet, for their first shots. The pup in the upper right corner belongs to Bruno Friis Jensen of Solrød Strand, Denmark.